Hey Style Lovers, happy Wednesday! I can’t believe it’s Wednesday already, didn’t the week just start? And to make matters worst January is almost done! 2017 is definitely moving fast. I’m working on a few special projects, and it just doesn’t feel like I have enough hours in the day anymore! Today’s outfit post which was shot on the streets of Toronto Canada, features some important fashion trends. Pleats, detailed sleeves, and booties, are all must have trends this season, and work perfectly in this look. What makes this pleated skirt stand out are the delicate metallic threads running through the knit fabric. I paired this pretty skirt with this beautiful blouse by Ziza Boutique. The blouse features a pleated neckline, and balloon sleeves. 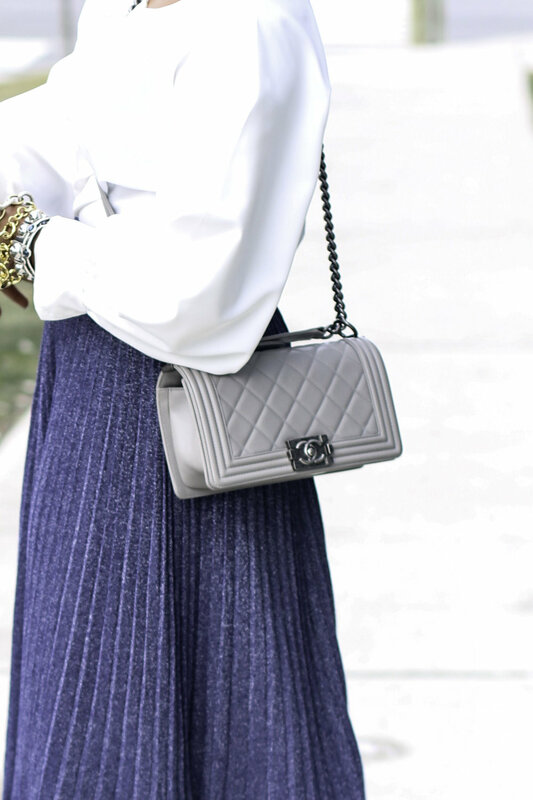 The sleeves elevate the blouse, making it extremely chic. A pair of booties lend a stylish edge, producing a look that is exceptionally versatile. Statement earrings, and a neutral bag complete this stylish outfit, and make it perfect for numerous events, including date night. I hope you guys get inspired by the look and use the links to shop the post. Also make sure you visit Zizaboutique.com, you will be shocked by the price of my gorgeous blouse, plus it also comes in burgundy. Have an awesome Wednesday my loves!